Haldex has over a period of time reviewed its development opportunities in the Hydraulic Systems division. An attractive area is products for diesel engines with a focus on emission reduction and fuel efficiency where Haldex already has a strong niche position with products such as Alfdex, Varivent and fuel pumps. Concentric also has a strong position in fuel pumps for diesel engines. In addition, Concentric provides innovative variable flow oil pumps, which reduce emissions and energy consumption. Demand for increasingly efficient pumps for diesel engines, such as fuel pumps for common rail systems, is growing due to increasingly strict fuel efficiency and environ¬mental requirements. With Concentric, Haldex Hydraulic Systems’ global reach in the diesel engine market, as well as production, sourcing and R&D, will be significantly strengthened. “Concentric represents an ideal acquisition target for Hydraulic Systems and will add to Haldex’s focus on leading edge technology and growth in structurally interesting niches. The acquisition is a first step in the strategic plan to optimize the Group structure and creates a strong Hydraulic Systems division”, says Joakim Olsson, President and CEO of Haldex. Concentric has a leading position in oil, water and fuel pumps for medium and heavy duty diesel engines used in commercial applications, trucks and construction equipment and has a comprehensive customer base, including all the leading diesel engine manu¬facturers, such as Cummins, Caterpillar and Daimler. The company has a long track record of innovation and is a technological leader in three principal applications - lubrication, cooling and fuel transfer. Concentric has a global manufacturing and sales network, including the US, UK, China and India, enabling the company to benefit from manufacturing and sourcing in low cost countries and sales and service operations in key international markets. The company is headquartered in Birmingham, UK and has approximately 670 employees. Concentric had sales of GBP 72m and operating income of GBP 9.8m for the year ended September 30, 2007, corresponding to an operating margin of 13.6%. The profitability level reflects Concentric’s strong product offering, its leading technology and the operational efficiency it has developed over the years and also shows the company’s ability to generate profitability despite the difficult market conditions in the US during 2007. Concentric will form part of Haldex’s Hydraulic Systems Division. Ian Dugan, CEO of Concentric, will take up the role as Head of Hydraulics and Concentric’s top management will continue to work within Hydraulics and bring valuable experi¬ence and management skills. 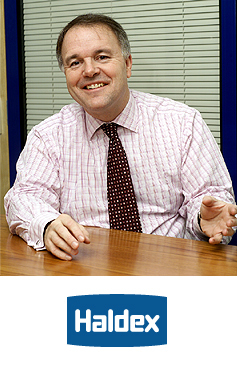 Brian Nelson, current Acting Head of this division, will continue in a leading role within the division. Haldex expects synergies from the acquisition to be derived from the areas of production, sourcing, R&D and engineering, sales and marketing, administration and transfer of best practices. Cost synergies are estimated at approximately SEK 70m on an annual basis and to be achieved within 3-4 years following closing of the transaction. Costs for achieving the synergies are estimated at SEK 15-20m. In addition, revenue syner¬gies from cross selling provide an opportunity for the combined business. Customers will benefit from the strong focus of both companies on technology leadership in environmental improvements and engine efficiency. Hydraulics will have a truly global manufacturing base and a powerful position in emerging markets, notably China and India. Including the acquired Concentric business, Hydraulics will have combined sales of approximately SEK 2.4 billion with a combined operating margin of approximately 8.5%, before realisation of any synergies and before any amortization of acquisition related excess values. The ambition is to grow Hydraulics to a turnover of SEK 3.2 billion – SEK 3.5 billion with an operating margin of 10-11% by 2011. “We are very excited about becoming part of Haldex Hydraulics Systems. Haldex and Concentric have brands and positions representing similar core values of quality and techno¬logical innovation. The complementarity of the two businesses in terms of product offering further enhances the potential of combining the companies” says Ian Dugan, CEO of Concentric. “The Concentric management team will add valuable expertise to Haldex Hydraulic Systems. With this transaction Haldex Hydraulic Systems has the foundation for being a truly leading business internationally with a niche product offering in applications for diesel engines and a strong focus on emission reduction and fuel efficiency”, says Joakim Olsson, CEO of Haldex. Haldex is acquiring 100% of Concentric from Concentric’s management and Bridgepoint Capital for a total cash consideration of GBP 75m. In addition, Concentric has net pension liabilities of approximately GBP 15m. Acquisition related intangibles, net of deferred tax, are expected to amount to approximately GBP 90m. The acquisition consideration will be paid in cash and financed through a combination of existing credit facilities and a new credit facility of GBP 75m provided by SEB. The acquisition will increase the net debt/equity ratio to 1.5x and the net debt/EBITDA ratio to 3.5x on a pro forma basis as of December 31, 2007 excluding restructuring costs. Haldex will continue to explore various strategic options for the Group structure, which could possibly lead to divestments and reduced indebtedness. Such processes have been initiated, the target is to achieve a net debt/EBITDA ratio of 2.1x-2.4x within 12 months. The acquisition is expected to be EPS accretive from 2008, before any synergies and amortisation of acquisition related excess values. The acquisition is subject to regulatory approval in Germany and is expected to close before the end of April, 2008.